We celebrated JJ's birthday on the weekend. 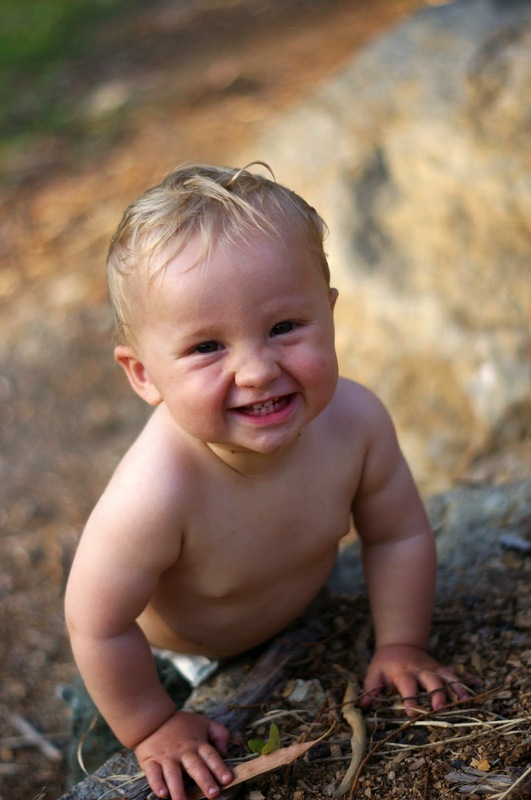 He turned one this week - where has the time gone? 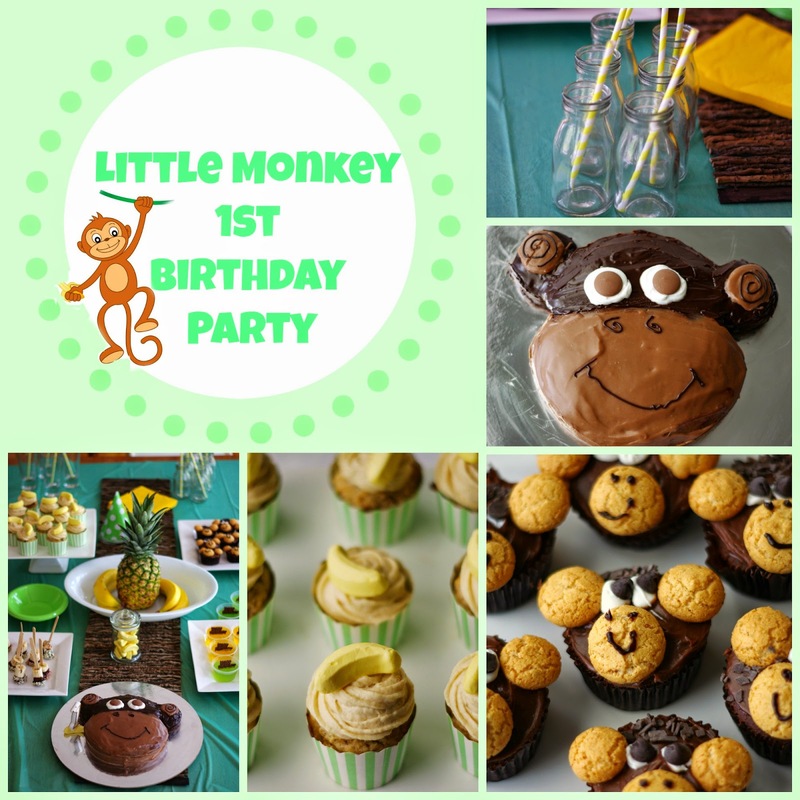 We had a small gathering of family and friends and after a little Pinterest help we decided on a Little Monkey theme. We thought it fitted his personality perfectly! 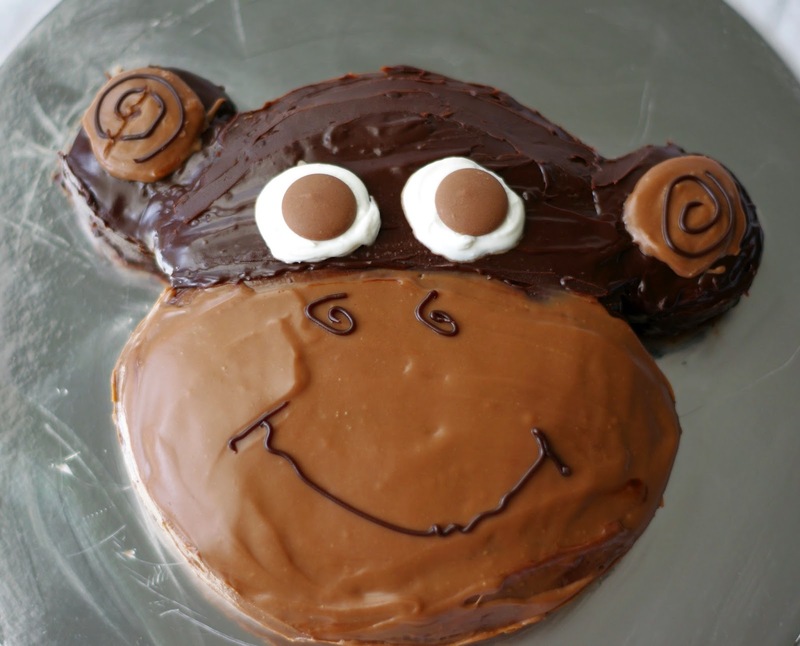 It started with a Monkey Cake. I used my all-time favourite chocolate mud cake recipe (recipe below) and it has never failed me. It is a great option for a birthday cake as you can make it up a day or two before you need it, wrap it up and store it in the freezer which then makes it easy to cut and decorate when you are ready. However as rich chocolate mud cake is not yet on JJ's menu, I also made some healthy banana muffins. However I managed to somehow make cream cheese icing taste disgusting and the muffins were only just okay. Apologies to the people that picked up one of these - I hate it when I add to the myth that healthy food doesn't taste good. At least JJ enjoyed it! 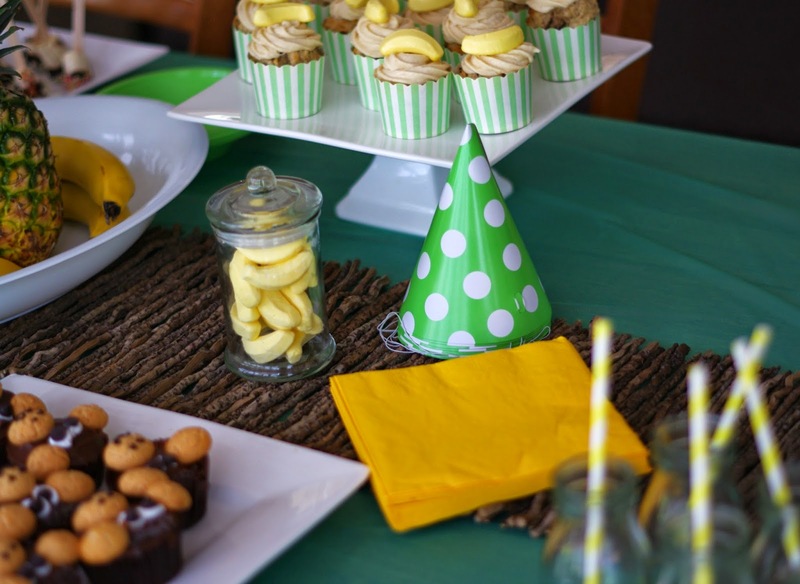 The table with a simple yellow and green theme. I had intended to make a palm tree out of two pineapples for the centre piece but in the end that seemed more effort than it was worth! The only other decorations were two green balloons I found in the draw and a 'vine' I made from attaching jungle leaves cut from green paper to twine which were hung with a string of fairy lights around our doors and window. 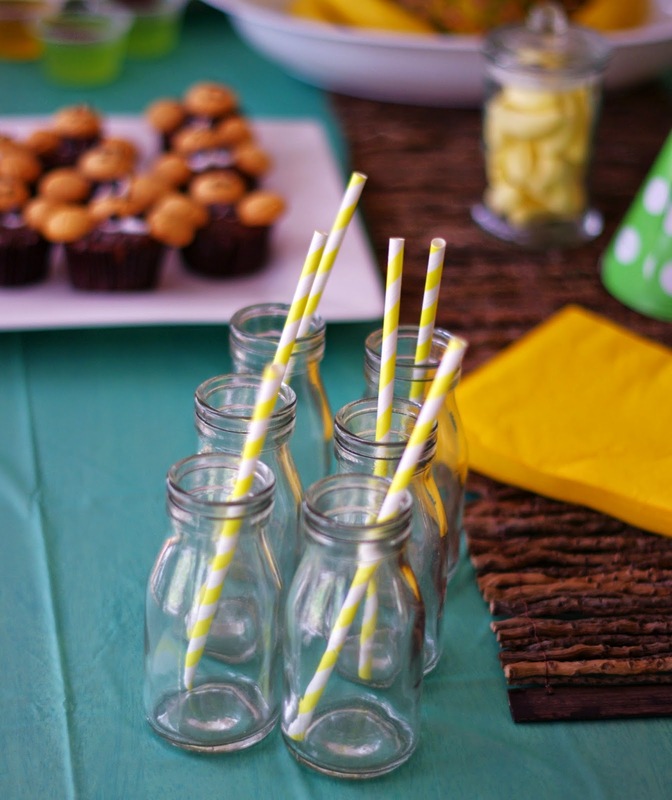 A few little finishing touches included serviettes, party hats and straws and milk bottles for the banana smoothie. 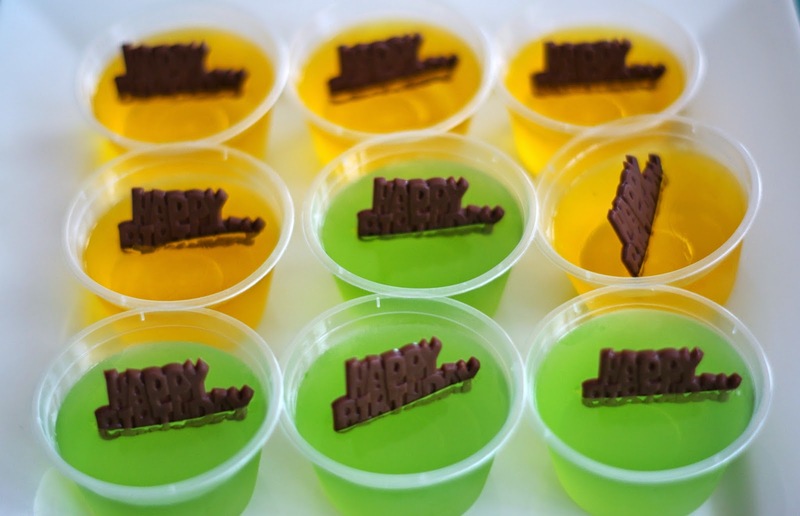 The jelly was a hit. 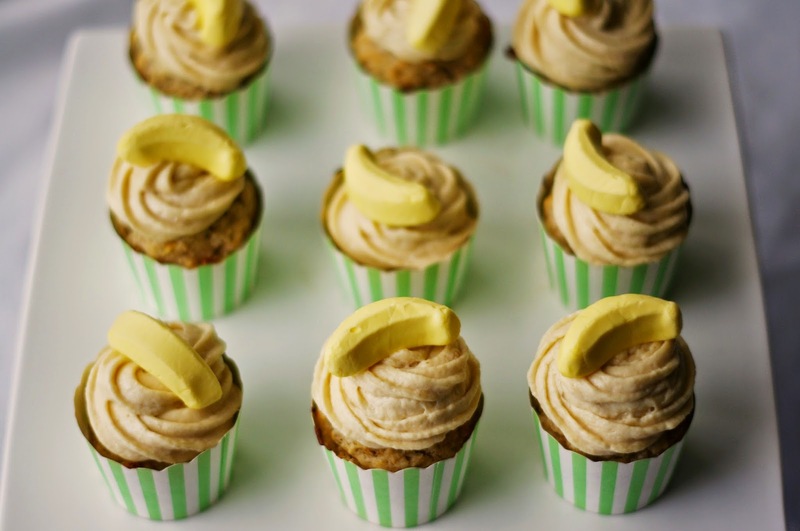 But these were my favourite, Little Monkey Cupcakes. 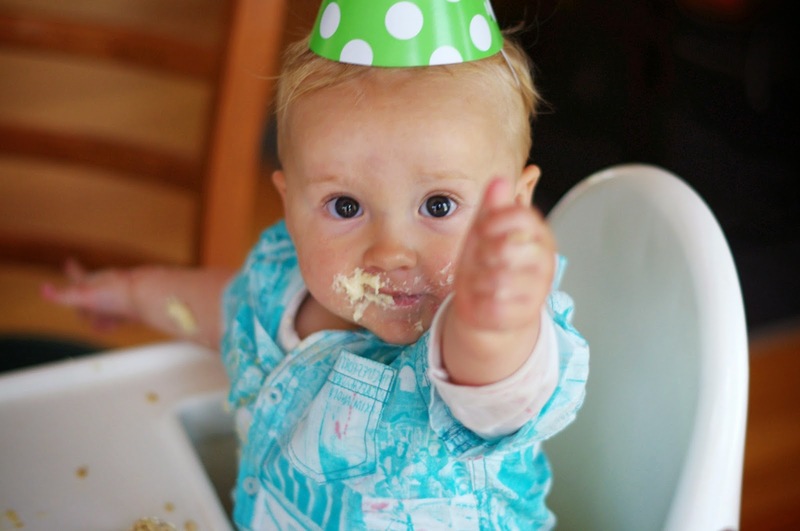 Happy 1st birthday to our little monkey! Chocolate mud cake - my absolute go-to recipe when I make a birthday cake. Grease and line your 20cm round cake tin and 8 muffin holes. Combine the butter, chocolate, sugar & water. Stir over low heat (or in the microwave) without boiling, until butter is melted and the mixture can be stirred smooth. Transfer to a large bowl and allow to cool for at least ten minutes. Combine the flours and cocoa powder. Whisk into the chocolate mixture in two batches. Pour the mixture into the prepared pan. Bake for about 1 1/2 hours, depending on your oven. Start checking on it from around the hour mark. Combine the dark chocolate and cream in a medium size saucepan (or in the microwave) and heat over a low heat until the chocolate is melted and smooth. Repeat to make a second batch of lighter coloured milk chocolate ganache. Allow the ganache to cool and thicken a little so it can still spread but won't run straight off the cake! Cut small triangles from the side of the cake to create cheeks. Use icing to fix a cupcake to each side of the large cake to create the ears. Ice the bottom half of the cake with the milk chocolate ganache. Ice the top half of the cake with the dark chocolate ganache. Use white icing to create the base of the eyes and use two chocolate melts to create the pupils. Ice small circles of milk chocolate ganache on the ears and finish with a twirl using an icing pen or some dark chocolate ganache in a piping bag. Use the icing pen piping bag to also create the nostrils and mouth. Use three small cookies to create the ears and mouth. Use white icing and chocolate chips to create the eyes. Use a chocolate icing pen to create the smile and nostrils. Create fur with some chocolate sprinkles. Happy Birthday to your son!!!!! 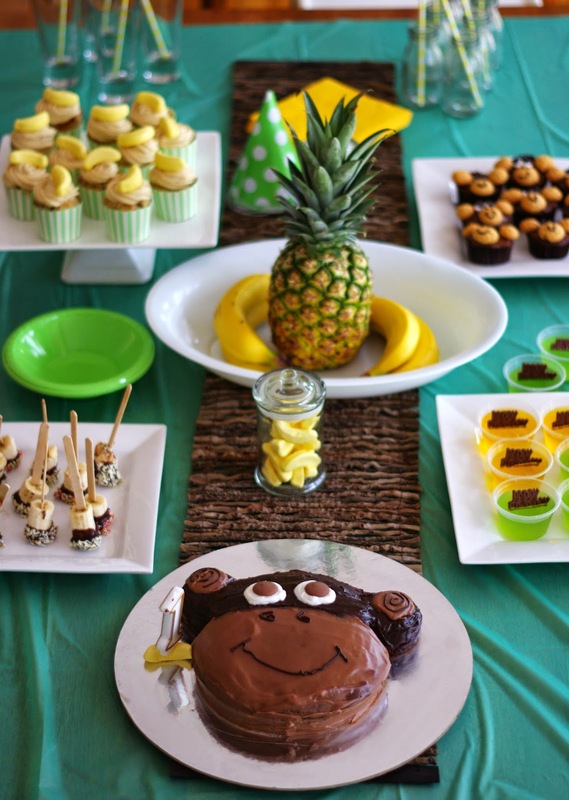 This party looks absolutely adorable :) I love the colours and how cute everything turned out! 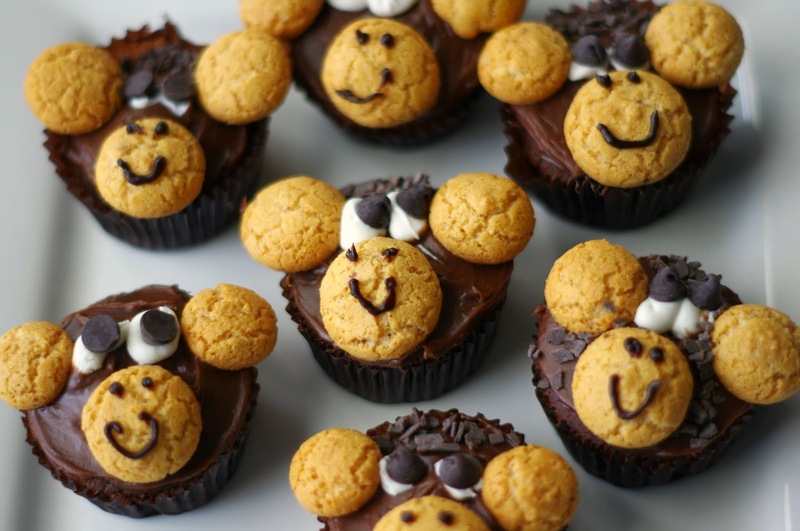 Those monkey cupcakes are awesome! And I love that pic with the thumbs up. Clearly the muffins were better than you suggest.